Average funding ratios fell by seven percentage points, amid down December. The late 2018 market rout created a not-so-merry Christmas for investors, enough to make even the Netherlands’ robustly funded pension funds a little nervous. 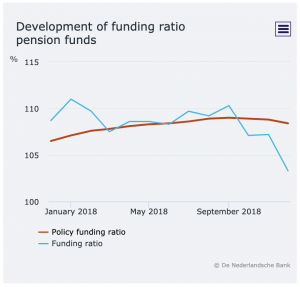 These particular plans are generally overfunded, but the market swings still caused the Dutch pensions’ funded ratios to fall seven percentage points, from 110.3% to 103.3%, according to data from De Nederlandsche Bank, the region’s central bank. Things were looking up for Dutch pensions at the end of 2017, and funded ratios were poised to keep rising. In 2017, Kris Kringle gave the program a present, with the average status at 108.7%. Things improved further into January a year ago, when the funding level peaked at 111%. Then Santa took a year off. The next several months saw ratios decline 3.2 percentage points, when they seemingly bottomed out at 107.5% in March. Dutch funding ratios then rose a bit, staying around 108.5% until July, when they hit 109.7%. The rally was short lived, as September’s 110.3% marked the beginning of the end. By December, Dutch funding ratios fell to 103.3%. De Nederlandsche Bank said the funded status “deteriorated” in Q4 because of “significant declines in stock markets and falling interest rates” in Europe. The policy ratio, an average of funding ratios over 12 months, only fell about 0.6 percentage points, from 109% to 108.4%. The national benchmark is 104.2%. This may seem exceptional, but the Netherlands’ measuring stick ends up helping funds with lower ratios go unchecked. This is because “most members have pension rights in a fund with a considerably lower policy funding ratio,” the bank said in a release. 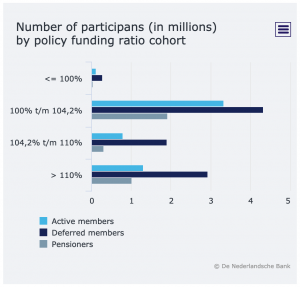 According to the data, nearly 10 million Dutch retirement plan members are in a fund at or below the 104.2% policy benchmark.